The Dragon with a Chocolate Heart by Stephanie Burgis, Bloomsbury US (May 30, 2017), Advanced Reader’s Copy courtesy of NetGalley. This was a very fun chapter book with an interesting premise. Aventurine is a young dragon tired of waiting to be old enough to go out on her own. She sneaks out of her cave, and while she is exploring, she runs into a young boy. He is making the most wonderful smelling drink, which she learns is hot chocolate, and he offers some to Aventurine. Unfortunately, it’s enchanted with magic, Aventurine is turned from a dragon into a human girl, and the boy disappears. Aventurine bumps into a couple who take her to a nearby town, and it is here she wants to pursue her new passion for chocolate. But first she must escape a woman who wants to make her an unpaid maid, convince someone she’s worthy of a chocolate apprenticeship, figure out how to trust humans that she’s always been told are the enemy, and find a way to come to terms with no longer being a dragon. The concept of a dragon becoming a human (instead of a human turning into some mythical creature) was original, and Aventurine was brave and spirited. I did have some issues with the fact that she never went looking for the boy who changed her into the human, and it felt like she too easily accepted that she was now a human. Despite this, the book was entertaining and flowed well. 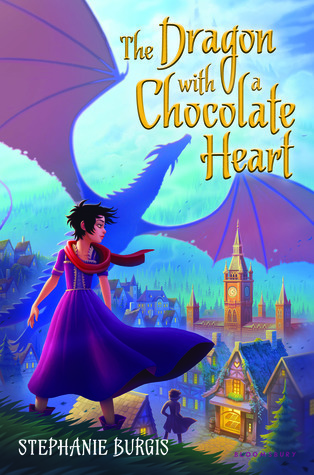 It will appeal to readers who enjoy dragons (and chocolate! ), and works well for a younger audience.